Almost Complete! Don't Miss This Offer! "Get Instant Access To 8 Of Our BEST-Selling PLR Lead Magnet Kits + Upsell Product Funnels!" Get Full PRIVATE LABEL RIGHTS To All 8 Product Funnels ﻿With Done-For-You Sales Materials! These 8 Products Are Proven To Sell! Here's your chance to sky-rocket your conversion rate and turn subscribers into new customers with these proven to sell, done-for-you PLR product funnels! You're going to get 8 of our best-selling PLR Lead Magnet Kits with full private label rights. You will also get instant access to each GOLD UPGRADE pack as well! Module 5: Professional Graphics Pack "PSD Files Included"
That's a Total of 160 Full-Fledged Modules! $37.00 for the main PLR product ...and $37.00 for the Gold upgrade package. That's a total of $148.00 if purchased at normal price. Take a look at the products again above and click on the link to view the live offer. People are still paying full price for it! Of course, you won't be paying $148.00. That works out to be just $5.40 per PLR pack + Gold Upgrade! That's a steal of a deal considering you're getting 8 of our best-selling PLR packages you can resell for 100% of the profit! 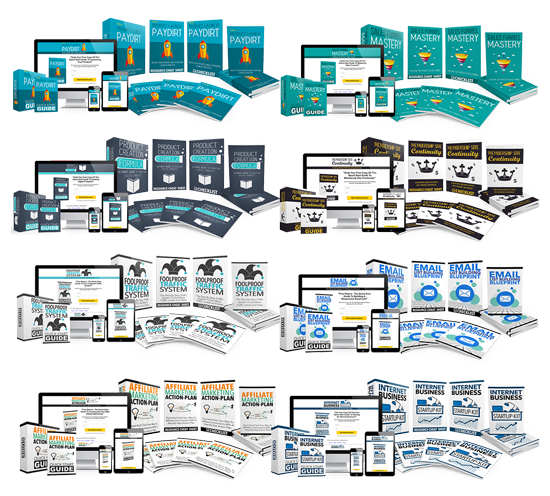 You'll Get Instant Access To All 8 PLR Packages + Gold Upgrades With All The Bonuses For a Mere $148 $47 (SAVE $101)!